Swagbucks is a search engine which rewards you with Swagbucks for searching. You can use it just like Google for searching and you will be randomly awarded Swagbucks for searching, I can usually bring in 50 - 100 a day. These Swagbucks can then be redeemed for a different free items in their store, my favorite being amazon gift cards which can be used to purchase anything. While Swagbucks started out only as a search engine, over the past few years, they’ve become much more. In fact, they now offer many different ways to earn more Swagbucks making it much easier to earn enough Swagbucks to cash in on their prizes. Please do note that you can only sign up for one account per household. If you try to open and use more than one account per household, they will close down your accounts. Resoundingly yes! I’ve earned 28 gift cards ($140!) from them since I’ve been using them for the last few years. In the beginning I was saving them for wedding purchases, and I was able to get some of our wedding stuff - our unity sand kit, jellybeans and popcorn for our welcome boxes, and our flower girls tote bag all for free. You can conduct internet searches by typing what you are looking for into the search box on the Swagbucks homepage. 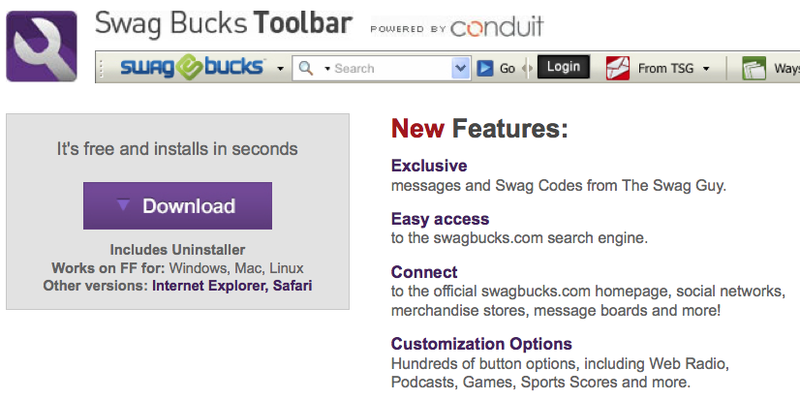 Or, you can make things easier on yourself and just install the Swagbucks toolbar. 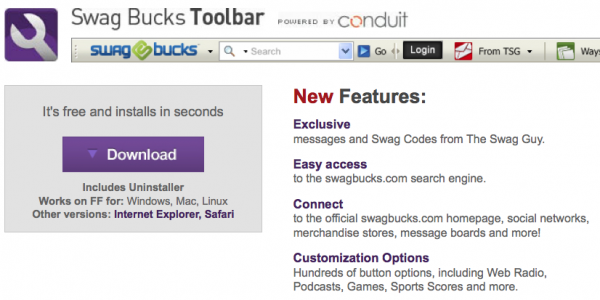 Then, when you want to search for something, you can just type it into the Swagbucks toolbar and search without having to open up the Swagbucks homepage. You can also follow the Swagbucks blog, as they often post free Swagbucks codes. They have been releasing at least one free code almost every day. Plus, you’ll be in the know about giveaways they are running and everything that’s new at Swagbucks. If you have sites that you visit every day (such as Facebook.com, Gmail, etc. ), search for those on Swagbucks and then bookmark the results page. Go to the bookmarked results page every day instead of going directly to the site and it will instantly re-search for the page and you’ll likely rack up quite a few randomly-awarded Swagbucks each week by doing this. For those of you who use coupons, you can earn 10 Swagbucks for every coupon you print and use at the store. Just click on the “Earn” tab at the top of the Swagbucks homepage and then click on “Coupons”. You’ll earn 10 Swagbucks for every coupon you print and redeem at your local store. Please remember that you will only receive Swagbucks for coupons you actually use. Just printing them won’t earn you anything, and it will waste your ink, so make sure to only print those you know you’ll use. In addition, it takes up to 12 weeks for the points to post to your account. Click on the “Swagbucks TV” on the dropdown menu under the “Earn” tab to pull up the Swagbucks TV Page. After you watch ten short videos you’ll earn three Swagbucks. You can also watch them directly from the swagbucks toolbar. I usually turn these on while I’m working on the computer (turn down the volume) and then bring up what I'm doing in a seperate window. This way I don't actually have to watch them. I just click back over every few minutes to start a new video and it’s a simple way to slowly rack up some points. You can earn a total of 75 points a day, so it’s a good way to multi-task while on the computer. Every day, Swagbucks offers a poll. Just click on the “Poll” on the dropdown menu under the “Earn” tab to pull up the page. Choose your answer and you’ll earn one Swagbuck. It’s simple and takes all of about 15 seconds to do. There are many, many special offers which require no credit card or payment to earn Swagbucks. Click on the “Special Offers” on the dropdown menu under the “Earn” tab to pull up the page which lists the various offers you can complete to earn Swagbucks. Unless you were already planning to sign up for one of the free trials which require a credit card, I would not suggest signing up for them as it’s possible you could forget to cancel and get billed. Swagbucks offers survey opportunities in which you can earn Swagbucks. Some people do really well with them, some people spend a lot of time filling out pre-survey questionnaires only to find out they don’t qualify. I tried my hand at the Swagbucks games and was less than enthused. If you’re unlike me and you enjoy computer games, this might be a great way to earn Swagbucks. Every day, you can go to the No Obligation Special Offers section and skip through all the offers by clicking No Thanks or Skip. At the end, you just have to type in a simple phrase and you’ll earn two Swagbucks. From start to finish, this will take you no more than 20 seconds and you can do it every day! The Swagbucks Facebook Page is a great place to find out if a swagcode has been released and clues for where to find it. All of this may seem complicated, but it doesn't have to be. Most days I'm at the computer I use the search tool when I need to search for something, or to bring up a page even if I know where it is. (for example, If I need to go to Gmail I will search for Gmail even though I know it's at gmail.com. It takes just as long and sometimes earns me points.) Once I'm at a page where I plan to be for awhile I let the swagbucks tv videos run on mute in a different window or the toolbar and every few minutes click over to start a new one. Then, once a day I do the No Obligation Search Offer and the daily poll. Like I said I was able to rack up over $100 before my wedding to pay for stuff, and I'm now saving for another big purchase!